He’d a hand, and a heart, and a brain. The notes in the book of ballads I found as a kid explained that “Howard” was the alias Jesse James used when he married, settled down, and tried to leave his life of crime behind. The dirty little coward was Robert Ford a friend of Jesse, who shot him as he straightened a picture on the wall of his home. Something in us recoils at that and wants to know how Ford could do it. We know in our bones why Dante assigned traitors to the lowest circle of Hell. I am not the only one who wonders, for the story has been dramatized several times, most recently in 2007, when Brad Pitt played Jesse in The Assassination of Jesse James by the Coward Robert Ford. 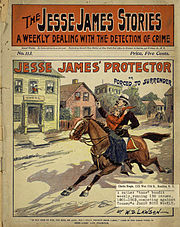 With Jesse James we get to witness a legend in formation, for unlike the Child ballads, this story is just over a hundred years old. We can see how imagination shapes facts the way the ocean smooths pebbles, and something in us prefers the legend – we want to know who the heroes and villains are and we want them larger than life. If you are like me, you’ll be disappointed to learn that no historical record shows the James gang ever using its loot to benefit anyone but themselves. 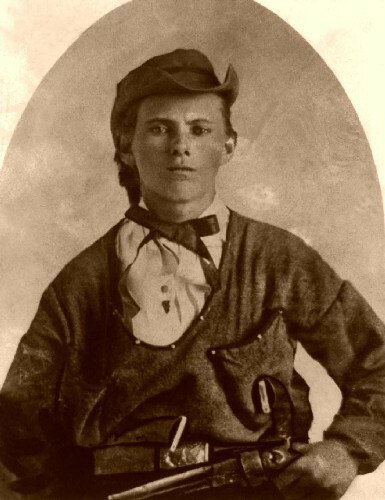 Jesse James, (1847-1882), and his older brother Frank, came of age during an especially bloody phase of the Civil War – the guerilla conflicts that raged across the border state of Missouri. The James brothers rode with William Quantrill, one of the most notorious guerillas; we would call him a terrorist now. Sixteen year old Jesse joined Quantrill in 1864, and supposedly took part in the Centralia massacre, where the band killed 22 unarmed Union troops then scalped and dismembered them. After the war, Missouri freed its slaves, but forbade ex-Confederate soldiers from voting, serving on juries or even preaching from pulpits; it was a fertile ground for outlaws. The James brothers joined with Cole, John, Jim, and Bob Younger, and went on decade long spree of robberies that spread from Iowa to Texas, and from Kansas to West Virginia. John Newman Edwards, an editor of the Kansas City Times, published Jesse’s letters and presented him as a symbol of Confederate resistance to Reconstruction. The James-Younger gang was adept at publicity, often hamming it up before crowds during escapes from stagecoach and bank robberies. Because they took safes and strongboxes and did not rob passengers, Edwards’s editorials painted Jesse as Robin Hood. The Pinkerton Detective Agency was hired in 1874 to stop the James-Younger gang, and after numerous setbacks, Allan Pinkerton took on the case as a personal vendetta. In 1875 he staged a raid on the James homestead and threw an incendiary device into the home. It exploded, killing Jesse’s half-brother, and blowing off one of his mother’s arms. This, more than any editorial, won public sympathy for Jesse James. A bill granting the James and Younger brothers complete amnesty was narrowly defeated in the Missouri legislature. Jesse married his cousin Zee in 1874, and two of their children survived to adulthood. The downfall of the gang came in 1876, when they raided the First National Bank in Northfield, Minnesota. All of the Younger brothers were killed or captured. Only Frank and Jesse escaped. Jesse tried to live quietly with his wife after that, in a home near St. Joseph, but he invited Charley Ford, a former gang member, to move in with the family for protection, and Charley brought in his younger brother Bob. Both Ford brothers had been in contact with the governor of Missouri about his reward for Jesse, dead or alive. One day, in 1882, as the three men were getting ready to leave for a robbery, as Jesse stopped to clean dust from a picture on the wall, Bob Ford shot him twice in the back of the head. This entry was posted in Music, oral tradition, Stories and tagged folklore, history, Music, stories, westerns. Bookmark the permalink. Nice post, Morgan. I knew little of the real history of Jesse James. This was very interesting and enlightening. Thanks.